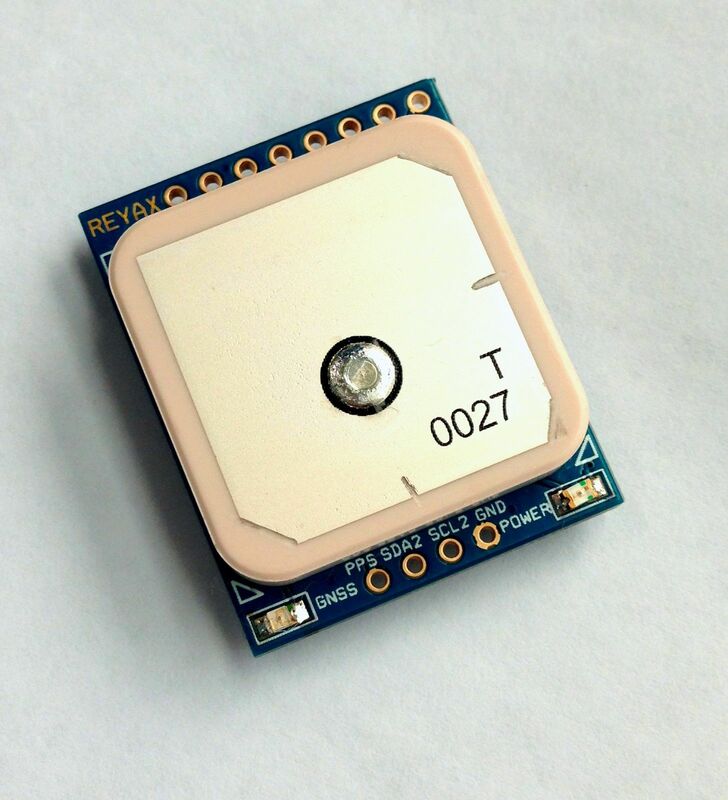 The RY725AI module is a GPS receiver that can retrieve information on latitude, longitude, time, altitude, magnetic variation, and more from satellites. It easily interfaces to a microcontroller or serial monitoring device via UART or by RS-232. 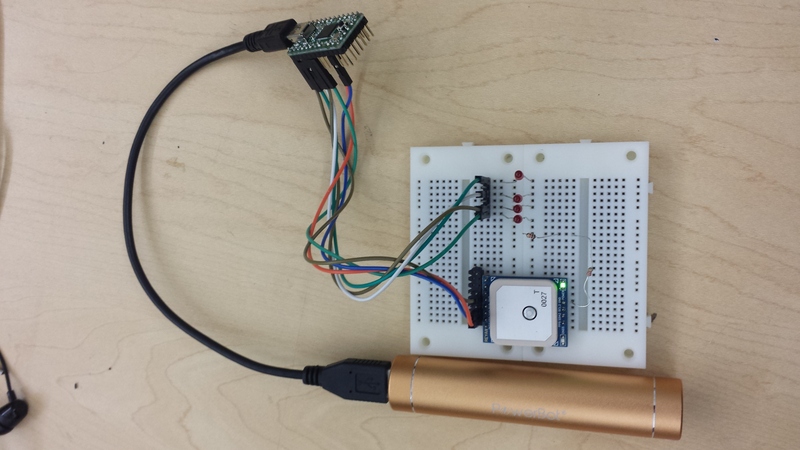 This module has many applications, ranging from tracking drones to making a simple hot/cold geocache game. u-blox NEO-7N GNSS(GPS, GLONASS, QZSS and SBAS) engine. 7 days battery backup time. Wiring: For the following example, the RY725AI will be connected to a Teensy 2.0 microcontroller and programmed to play a simple hot/cold geocaching game. 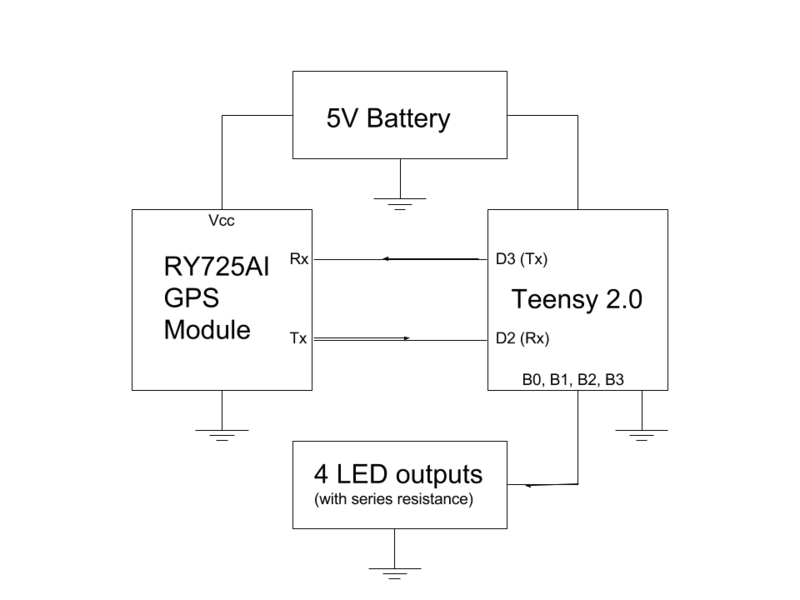 In order for the RY725AI to communicate with a Teensy 2.0 microcontroller, the Teensy’s Tx pin must be connected to the gps module’s Rx pin, and the Teensy’s Rx pin to the gps module’s Tx pin. The teensy’s pins B0-B3 will output to four respective LEDs, each with a series resistance of 1k Ohm to limit current. Ensure that the LEDs are oriented properly, with the positive lead towards the Teensy’s pin and the negative lead connected to the resistor going to ground. Lastly, to make the project portable, attach a 5V battery to both the Teensy and the GPS module for power. Programming: Download the Teensy loader and the files below. This code will decode the signals from the RY725AI in order to determine latitude and longitude. Depending on the distance from the GPS’s location to a hard coded target location, more or less LEDs will turn on. To program the Teensy, plug in the Teensy to a computer, start up the Teensy loader program, and open the pre-compiled hex file from the example in it. Next, press the reset button on the Teensy, then click program, then reboot. Now the microcontroller is programmed with the hot/cold game, and you can test the project outside. Keep in mind the the GPS takes several minutes to warm up and begin outputting useable signals. Further Exploration: To edit the example code or write your own, first ensure that the avr-gcc compiler is installed. Then, open and edit gpsFunctions.c and main.c in an editor of your choice and compile them using the makefile provided.